The management of The Mission Hospital was clear from the outset that the hospital would not only have to set the highest standards for quality healthcare but also that of good corporate citizenship. While the long term vision envisages setting up of full scale training facilities, the initial focus expectedly has been on getting the hospital up & running. 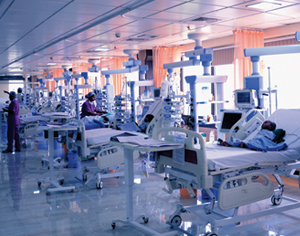 In order to be able to adequately address its responsibilities of corporate citizenship even during these initial years and keeping in focus the training of skilled personnel for healthcare industry, in 2008 the hospital signed a long-term agreement with Sparsh Foundation – the pioneers of industry tagged vocational training in this country. Sparsh Foundation, a small, autonomous, Indian, not-for-profit Society, headquartered in Kolkata, are specialists in planning, designing & executing training modules for the youth – specially from financially disadvantaged families who have been compelled to discontinue studies in formal academics at various levels in school, more often than not due to poverty related issues. The goal is to develop easily replicable prototypes of short-duration, vocational training courses for the millions of unskilled dropouts in India in various trades that offer huge employment potential in a new world economic system. Having already pioneered India’s first garment manufacturing training program conducted in association with NIFT & AEPC, Sparsh Foundation had, in 2007, begun India’s first & only Medical Technician courses with minimum entry level at class 10 pass only. The healthcare industry in Bengal has been growing over the past 5 years at an amazing rate (4000 more beds added in specialty & multi-specialty hospitals only). This was thus a perfect match between the burgeoning industry requirement for skilled professionals to handle latest technology driven equipment and the need to provide adequate livelihood training to the lakhs of children in the state who drop out of school every year at that level. 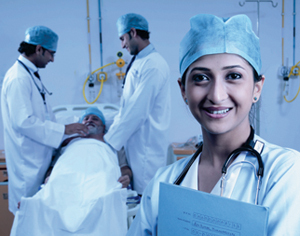 Sparsh Foundation had forayed into Medical Technician courses with India’s only ever formal course in CSSD that they conducted in association with Apollo Gleneagles Hospital (Educational Trust) in Kolkata and under affiliation of the West Bengal State Council of Technical Education. The Mission Hospital well understood the crucial importance of such courses not only in ensuring the providing of quality service to patients but also in providing the lifeline to a better future to a mass of disadvantaged youth of the state. And so readily agreed to becoming a training partner (providing infrastructure & impartation of technical knowledge & skills) in Sparsh Foundation’s hugely successful Medical Technician Training Program. With a shared view of the hospital’s internal requirements for human resources over the long run, Sparsh Foundation initiated the MTT program in the Durgapur hospital with technician courses in CSSD (Central Sterile & Supply Dept. 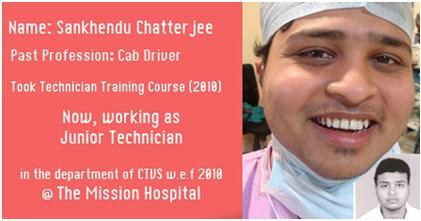 ), OR (Operation Room) & EMT-CCU (Emergency Medical Team – Critical Care Unit). All pass-outs until date are gainfully employed - most working in the hospital itself, while the few who moved out are valued employees with big brands as Fortis & Apollo. Plans are on the anvil to extend program scope to technician courses in Anesthesia, Cath Lab, Path Lab, Phlebotomy etc. To make it possible and easy for all students, with interest & ability, to undertake these courses on their own steam, Foundation arranges for all selected trainees to receive systemic, pre-approved, interest-free, education loans from commercial bank with repayment holiday and without need for any individual collateral, security or guarantor – to part finance program cost, the residual amount being provided as grant. Between that facility and dedicated impartation of knowledge & skills by the faculty from with hospital and beyond, disadvantaged boys & girls from in and around Durgapur today have the chance to bright futures where almost none existed. Over the years to come, the hospital, through this wonderful association with Sparsh Foundation, expects to be able to offer hundreds of others the same opportunity. Thereby saving lives in more ways than one! !